By now I think we’re all aware of the culinary delights that await Metro riders traveling into East L.A. on the the new Gold Line extension. But last week Metro Media Relations released a press release that caught my eye (and my appetite) with a list of tamale vendors along the Gold Line that are regarded as some of the best in L.A. I take my role as car-free lifestyle blogger seriously, so as my colleague Steve Hymon reported on the Metro Board meeting all last Thursday, I took it upon myself to go tamale hunting in East L.A. with the Gold Line as my “tamale trolley” and Metro’s press release as my map. One disclaimer before I report my findings: I’m not a tamale connoisseur. While I’ve grown to love these traditional Mexican treats, I was not raised on them. In my household my mother would make the Venezuelan equivalent to tamales – hallacas – and I would refuse to eat them because they were wrapped in green plantain leaves. As a child I had a strict rule against eating anything green. Luckily, tamales are wrapped in non-green corn husks. Metro’s press release lists seven tamale vendors within walking distance of four Gold Line stations – Soto, Indiana, Maravilla, and Atlantic. I decided to ride out to the end of the line (Atlantic) and work my way back. Like so many L.A. gems, La Delicias is hidden in a strip mall. 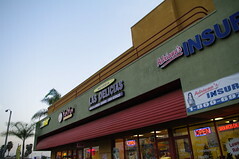 Las Delicias (287-A S. Atlantic Blvd.) is located in a strip mall just steps away from the Atlantic Station. The unassuming store is confusing at first for the tamale hunter because it specializes in juices and smoothies and resembles an ice cream parlor rather than a tamale shop. This confusion, combined with the rather long line inside, made me hold off on Las Delicias and save it for another trip. I hopped back on the train and rode down to Maravilla Station. As the train approached I saw my next target: King Taco (4504 E. 3rd St.). The restaurant is located just off the platform and is unlikely to confuse anyone for anything other than place to get awesome Mexican food. There’s an inside seating area, but you order at one of the many windows outside. Posters advertising their tamales ($1.35 each or a dozen for $12) told me I had come to the right place. I ordered four tamales – two pork, a chicken tamale, and a cheese and jalapeño tamale. Within minutes I was given a heavy bag of my freshly steamed order and I hopped on the train to my next destination. 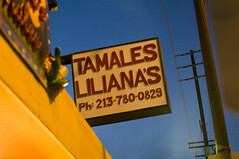 There are a number of options at Indiana Station, I settled for the closest one: Tamales Lilianas (3448 E. 1st St.). This little restaurant is one block west of the Indiana Station on 1st Street. There’s table service, but I opted to go the counter and get my tamales to go. This time I opted for a green chile tamale, a red chile tamale, a pork tamale and a dulce (sweet) tamale. The prices were just as affordable as King Taco and the service just as quick. I made my way back to the station, now with two heavy bags of tamales in tow. I exited the underground Soto Station and found myself completely charmed by my surroundings. The north side of 1st Street across from the station has a small collection of tightly crowded restaurants, bars, and other businesses lit with neon. Los Antojitos (2122 E. 1st St.) is about three block west of the Soto Station along 1st Street. On the north east corner of the 1st and Chicago St. there’s a beautiful little pocket park and across the street from that is an architecturally stunning police department. I’m bringing up the surroundings instead of the tamales because when I reached Los Antojitos it was already closed for the night. 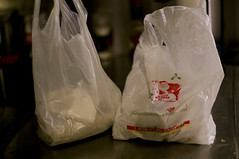 Two bags of tamales, enought to feed me for a few days, cost about $10. In the end I had a semi-successful tamale hunt, arriving home with eight tamales from two of the seven vendors I set out to find. As for the tamales themselves? Delicious! Between King Taco and Tamales Lilianas my personal preference goes to King Taco, but only by a small margin. Both had tamales that were flavorful and satisfying, but King Taco’s tamales seemed to be better constructed. The tamales from Lilianas tended to fall apart when unwrapping the corn husks. Also, I had never had a dulce tamale before, and while the sugary filling and corn meal made for an interesting combination, I much prefer the savory to the sweet. 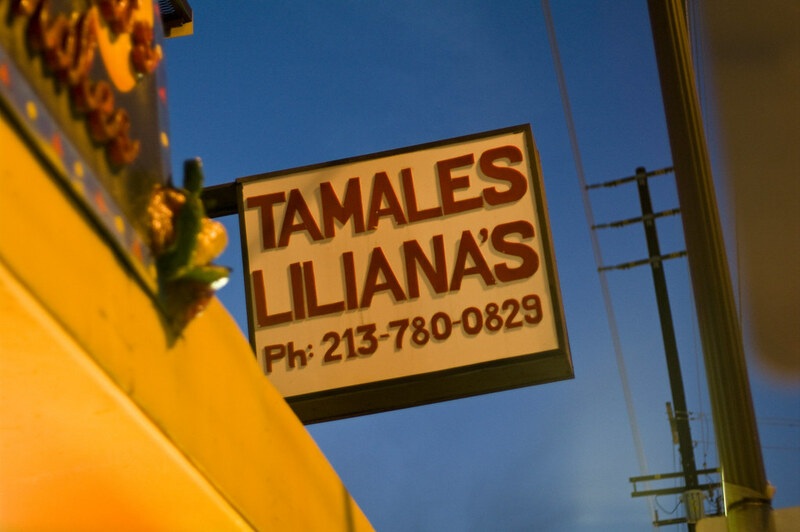 Two Gold Line tamale shops down, five to go. It’s a tough job, but somebody’s got to do it.